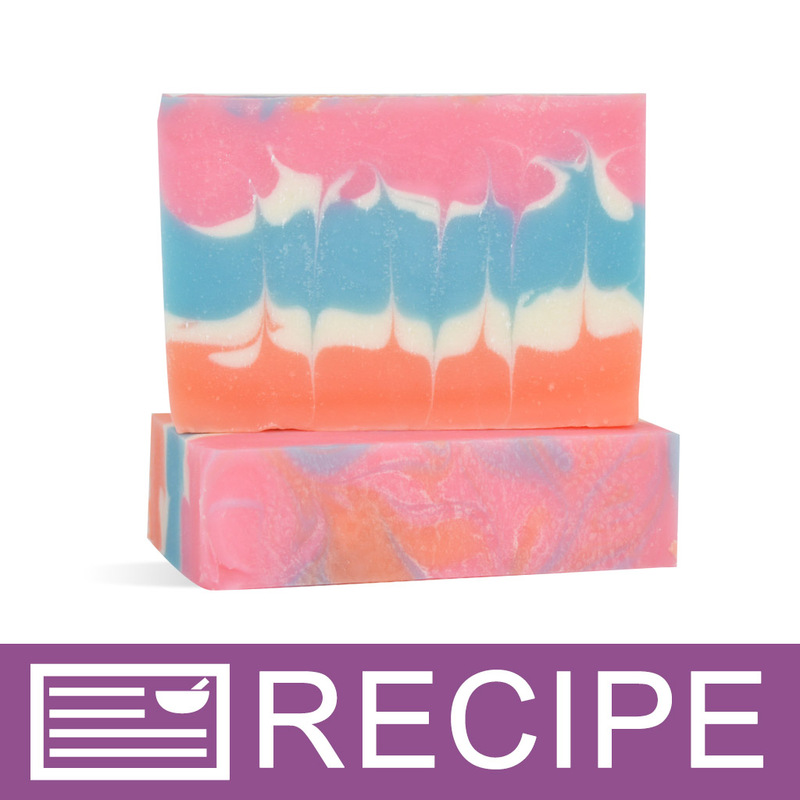 We used the hanger swirl technique to make this Cuban-inspired soap. The bright colored layers remind us of the sorbet pink, sand yellow and ocean blue houses and old-time cars found in Havana. 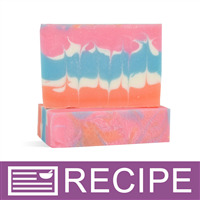 The soap is scented with a brand new fragrance oil, Crafter’s Choice® Cuban Colada. The sweet smell of pineapple juice, coconut cream, and grated cinnamon will leave you yearning for a vacation to the once forbidden island. INCI Ingredient Label: Olive Oil, Water, Coconut Oil, Palm Oil, Sodium Hydroxide, Sunflower Oil, Fragrance, Mango Butter, Sodium Lactate, Titanium Dioxide, Bis(Glycidoxyphenyl)propane/Bisaminomethylnorbornane copolymer, Aluminum Hydroxide, Yellow 10, Red 28, Red 22, Blue 1. If you do not have a hanger tool you can make one using a wire hanger. Using wire cutters, trim the top of the hanger off. Measure the length of the inside of the longest side of your soap mold and using pliers bend the wire at two right angles so that it will fit in the soap mold. After you have bent the hanger make sure the tool fits snugly into the soap mold but not too tight that you will not be able to move it up and down. Using the pliers make any needed adjustments to the tool. In separate plastic beakers measure out your fragrance oil, vanilla color stabilizer and sodium lactate and set aside. To prepare your colors add one neon color to each funnel pitcher, add the white to a plastic beaker. Add a small amount of melted oils/butters to each and mix each well using the mini mixer. When your lye water has cooled to 120° F or cooler add the sodium lactate and mix in. Right before mixing your lye mixture and oils, combine the fragrance and vanilla color stabilizer. Blend well and allow to sit at least 2 minutes but no longer than 15 minutes total. When both the lye mixture and the oils are approximately 100° F or below, pour the lye mixture into the melted oils. Stick blend until emulsified. It is best to keep the batter at a very thin trace to start. Then add the fragrance/stabilizer mixture and blend in by hand or with a few short bursts of the stick blender. Using the scale, fill each funnel pitcher with approximately 11 oz. of soap batter. Add the white pigment mixture to the remaining soap batter. Blend each color moving from lightest to darkest until the colors are fully mixed in. You can layer the colors in any order you would like pouring thin layers of white in between the middle layers. It is best to bring the first color to a medium to thick trace so that the next color will not break through the layer. Reserve a very small amount of your first two neon colors to create a swirl on the top. After all layers have been poured, insert the wire hanger tool down the side of the loaf mold. While the tool is pressed against the bottom of the mold, move it fractionally towards the other side of the mold and then pull it straight to the top of the soap. We did not pull the tool completely out of the soap but made sure it remained covered by a thin layer. Continue this same motion until you reach the other side of the mold, then pull the tool straight out along the side of the mold. Sprinkle lines of the remaining soap batter on the top of the soap. Insert the tip of the skewer into the top and swirl the colors. If preferred, insulate the mold and then allow to set at least 24 hours or longer until soap is firm enough to unmold and slice. Remove soap from mold and slice into bars. "recipe calls for sodium lactate, but not specified in the ingredients on how much . i had to use another recipe n hope this works"
Staff Answer We do apologize that the sodium lactate was missing from the ingredient list. We have updated the recipe with this item. Thank you for bringing this to our attention. "Can I sub the mango for Cocoa Butter ? If so how much cocoa butter , or shea butter vs mango. 1 oz cocoa butter ? " Staff Answer You would need to run this through the lye calculator if making any changes to the recipe since these butters have different SAP values.